The genetically distinct Southern Appalachian strain of Brook Trout is the only native trout species in Appalachia. Its range has been drastically reduced due to deforestation and competition with introduced trout species. With its white-edged fins, ruby belly and golden speckles, the Southern Appalachian Brook Trout is one of the Southeast’s most strikingly beautiful game fish. However, the impact of deforestation and competition with introduced species like the Rainbow and Brown Trout has reduced Southern Appalachia’s only native trout to just 15 percent of its historic range. Thanks to ongoing support from the Appalachian Chapter of the Trout Unlimited, the Tennessee Aquarium Conservation Institute (TNACI) and its partners are making headway toward returning the Brook Trout to regional mountain streams from which it had all but disappeared. 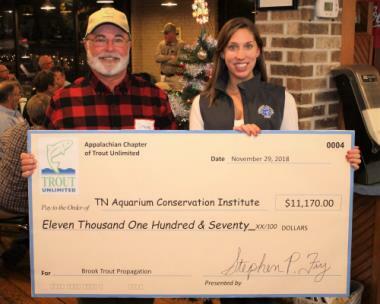 On Thursday evening, Trout Unlimited’s Appalachian Chapter President, Steve Fry, presented Tennessee Aquarium Conservation Institute reintroduction biologist, Meredith Harris, with a check for $11,170. This amount is the organization’s largest conferment since it began financial support for the Aquarium’s Brook Trout restoration work in 2014. Aquarium staff first joined Trout Unlimited for Brook Trout surveying in 1996. Five years ago, the nationwide organization began donating to support the Aquarium’s conservation efforts using funds raised through the sale of special vanity license plates. In addition to fully financing the Aquarium’s propagation and release efforts, Trout Unlimited offers an invaluable “community of support,” said Tennessee Aquarium Reintroduction Biologist Meredith Harris. The Brook Trout’s range extends north into New England and Canada and westward into the Midwest, but the population in Southern Appalachian — the Southern Appalachian Brook Trout — is genetically distinct. The Aquarium’s restoration project aims to safeguard and preserve this unique community as an important component of the Southeast’s natural heritage. The restoration work encompasses every stage of the Southern Appalachian Brook Trout’s life cycle. Wild adults are collected and transported to the institute’s freshwater science center near downtown Chattanooga to spawn. After the eggs hatch, the offspring are raised by biologists until they’re large and hardy enough to be re-released into the species’ ancestral streams. 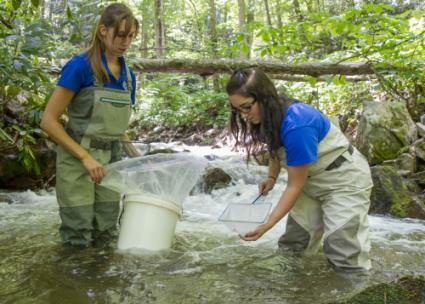 In concert with representatives from the U.S. Forest Service, Tennessee Wildlife Resources Agency and Trout Unlimited, a team of Aquarium biologists this June released 280 juvenile Brook Trout into Little Stony Creek flowing through Cherokee National Forest in Northeast Tennessee. 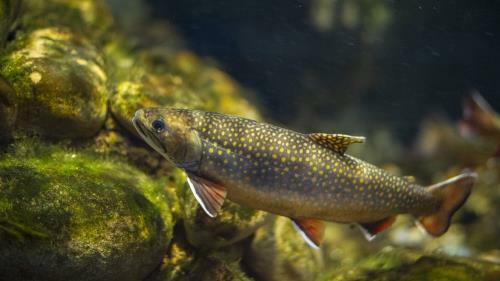 "Thanks to the continued support of Trout Unlimited, the Aquarium and its partners will continue making headway toward restoring Brook Trout to its lost territory. That will be a long process but one worth undertaking," Ms. Harris said. To learn more about the Tennessee Aquarium’s work to restore the Southern Appalachian Brook Trout, visit tnaqua.org/protecting-animals/southern-appalachian-brook-trout. 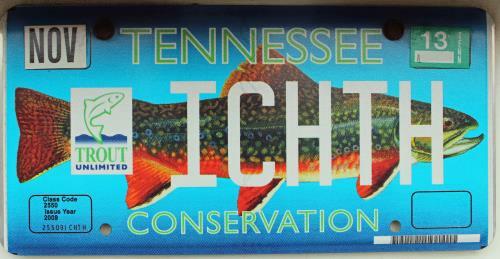 For more information about the Appalachian Chapter of Trout Unlimited, visit appalachiantu.org.